Illusion were a British band formed in 1977. 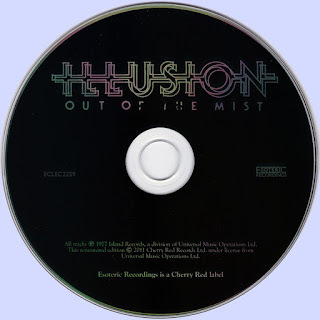 They released two albums Out Of The Mist and Illusion both on Island Records. Their music was classically-inspired, sophisticated and polished. The band undertook a number of tour dates, but found their style of music out of fashion with the rise of punk rock. They didn't get a new recording contract from the record company. Since other companies weren't interested either at the time, they finally disbanded. Illusion were intended to be a reunion of the original line-up of Renaissance, but singer and guitarist Keith Relf died before the project had been realized. He got electrocuted while playing his electric guitar. In a way his death turned out to be positive for the other musicians because when Relf was still alive family issues kept him from working on his new band named after the second album of Renaissance. They couldn't use the name Renaissance because this band continued with a different line-up after their first two releases. After the death of Relf some line-up changes took place before they could record their music. Jim McCarty moved from the drum stool to the acoustic guitar and shared vocals with Jane Relf, while Eddie McNeill replaced him on drums. John Knightsbridge took Keith Relf's place as guitarist. The other core members who performed on most songs on Renaissance and Illusion completed the line-up. This meant that John Hawken played the keyboards and Louis Cennamo the bass guitar. The two albums they recorded under the name of Illusion got a proper CD-reissue in 2011. These re-releases are way better than all the other previous re-releases. This time the liner notes include many pictures, all the lyrics and a retrospective by Jim McCarty, but most important: this remastered version sounds as all reissues should! Please post their other albums.